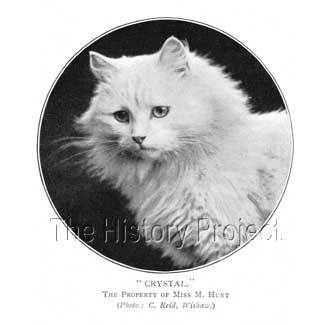 Crystal is a most enigmatic cat with an unparalleled public profile for her era. 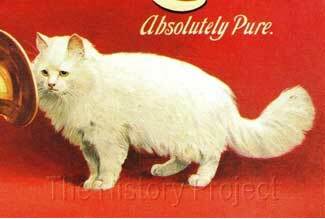 She was also a standard-bearer for pedigreed felines used in advertising. She is one of the most photographed of the early cats, with numerous postcard images extant in collections, and her image variously used to promote a range of products. In an age when copyright, although promoted, was seldom able to be enforced, her images were subsequently scattered across Europe, with uncompromising promiscuity by printers and traders in postcards. Crystal was bought by Miss Mary Hunt, when she was exhibited as a kitten at the Crystal Palace Show of that year. From Frances Simpson’s The Book of the Cat we have Miss Hunt’s own description of the purchase, (as at 1903). The NCC studbook under the registration details for Crystal, records her wins at the Crystal Palace in 1898, winning both a 1st and a 3rd. Miss Hunt goes on to say of Crystal’s winning ways: "Crystal herself has only once been beaten by a white cat,and that had not even blue eyes; but she was in splendid coat, and Crystal was quite out of coat. Most judges are agreed, I think, that ‘Crystal’ is the best blue-eyed white female in the country."1. Only two sibings are noted. 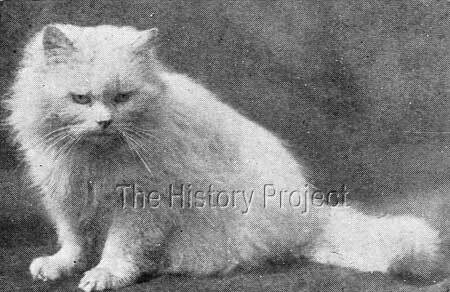 The first is Scotland’s Prince, a Blue-eyed White male, with same birth date,(NCC: Regn.3007) formerly owned by Miss R.A.Packham, and then by Miss Gertrude Willoughby (later Lady Decies). His name subsequently changed to Fulmer Scotland’s Prince upon his change of ownership. His wins recorded in the NCC Stud Book are listed as 2nd Special, Botanic, 1899; 2nd CP 1899; 2nd Brighton, 1899. A second sibling was Snow King, (no date of birth) but shown as the sire of “Aisha” in the CCR Studbook, with his parentage being identical, by Blue Jacket ex Lilywhite, and his owner/breeder listed as Mr. A Gairn. (Possibly a litter brother to Crystal that had been retained by her breeder). 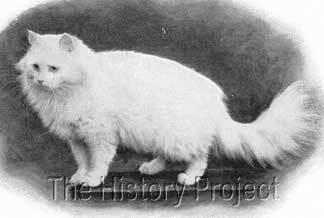 “Another instance of breeding from odd-eyed whites was the two beautiful cats, Scotland’s Prince and Crystal. 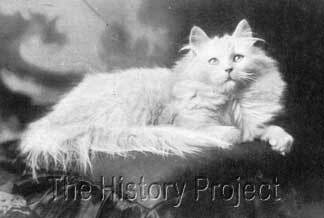 These two were from the same litter, and bred by Mr. Gavin of Edinburgh, from his odd-eyed white queen, Lily White, mated to the famous yellow-eyed Ch. Blue Jacket." 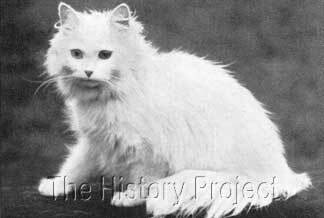 Crystal helped to establish a veritable dynasty of white Persians. Crystal was one of a number of queens, who, when coupled with the famous “White Friar” (formerly Tim of Redgrave), literally established a veritable dynasty of Whites. But the beginnings were thwarted with disaster. The “White Friar” lines and especially those from a combination which included ‘Crystal’, were highly sought after. Ladysmith, (dob: unknown) , owned by Hon. Mrs. McLaren Morrison. Jovial Monk (dob: unknown), owned by Miss Ward. Crystal Friar (dob: unknown),(deceased) owned by Mrs. Champion. ‘Ch.White Friar’ (formerly Tim of Redgrave), was originally owned by Mrs. Horsfall, but was sold to Mrs. Champion in 1898, with whom he resided, until he was sold to Mrs. Finnie Young and Miss Mary Hunt, in 1900, prior to Mrs. Champion emigrating to the United States. Photo: US Register & Studbook (1906). Hon.Mrs. McLaren Morrison’s (Odd-eyed?) White Persian, ‘Ladysmith’, by ‘White Friar’ ex ‘Crystal'. Photo: by C.Reid, from “The Book of the Cat” by Frances Simpson (1903). 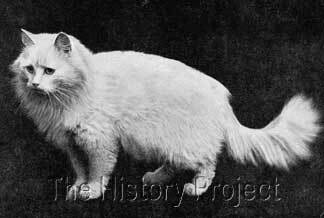 Miss White Atkins, Blue-eyed White Persian, ‘White Butterfly’ by ‘White Friar’ ex ‘Crystal’. Photo: by E.E. Lipputt, from ‘The Book of the Cat’ by Frances Simpson (1903). 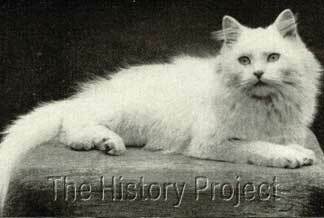 Miss Ava L.Pollard’s, Blue-eyed White Persian, ‘Ch.Purity’, by ‘White Friar’ ex ‘Crystal’. Photo: from ‘Country Life in America’ (1908), courtesy of The Harrison Weir Collection’. One of the most successful of ‘Crystal’s progeny, winner of 47 prizes by 1908. Noted dam of ‘Ch.White Monk’,(1903) by ‘White Tsar II’ and dam of ‘Ch.Puritana’,(1905) by Oberon. Crystal appears to be one of the most prominent forerunners of pedigreed cats to be used in promotional advertising, closely followed by the famous Chinchilla ‘Ch.Fulmer Zaida’, and a plethora of Blue and other coloured Persians, and notable Classic Tabby Shorthairs, among the most prominent being ‘Ch. Xenophon’. The examples shown below, demonstrate how just two of her many images, have been transformed and used to promote a product. 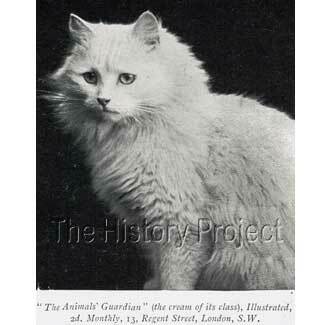 This circular image of ‘Crystal’ comes direct from a photo by C.Reid, on page 122 of ‘The Book of the Cat’ by Frances Simpson (1903), but is clearly tilted, and taken from a larger photo which has been used on the Postcard/Business card shown here, advertising ‘The Animals’ Guardian’ magazine. The card is postmarked 1904. (Image courtesy of The Harrison Weir Collection). Similarly, another image of 'Crystal', a photo by C.Reid ,that appears on page 16 of ‘The Book of the Cat’ by Frances Simpson (1903), has been used both on postcards with a dark background, as a close-up photographic study, (as is shown at top right of this page under the Fact File) and reproduced as an artistically enhanced graphic in colour, in a Cadbury’s Cocoa advertisement. Photo: C.Reid, taken from Pg 16, ‘The Book of the Cat’ (1903) by Frances Simpson, published by Cassell & Co. Photo: C.Reid, appearing on a Russian Postcard, circa 1904, courtesy of The Harrison Weir Collection. Photo: Close-up of Cadbury’s Cocoa Graphic based upon the photo of ‘Crystal’ by C.Reid. 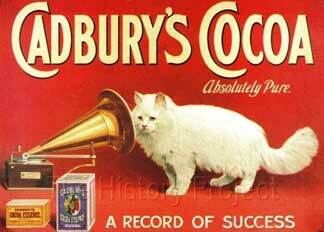 Photo: Cadbury’s Cocoa Graphic, a parody of HMV advertising of the era, which featured Nipper the Dog, listening to a Phonograph. Image of the cat based on the photo of ‘Crystal’ by C.Reid. There are too many such instances of Crystal’s images used in this way, to be shown here, but these few examples will suffice to demonstrate their wide usage, and to show that ‘Crystal’ was, without doubt, one of the first modern-day flag-bearers for Pedigree Cats, in the developing new age of mass advertising. 3. Photos as per sources quoted.